This is probably the most beautiful route up Kilimanjaro. All your equipment and supplies are portered and a cook prepares all your meals. Where accommodation on the Marangu route is in huts, the Machame route offers strictly tents only. This makes Machame (also referred to as the "Whiskey route") better suited to the slightly more adventurous hiker, however rewarding him with a scenic splendour such as not seen on the Marangu route. From late afternoon sunsets at Shira, to the misty revelations of Kibo at the great Barranco Wall, the Machame route offers the adventurous hiker a stunning scenic "slide show" over 6 days. 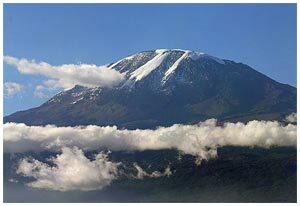 The Machame route is normally completed in a minimum of 6 days. There is an added benefit to this, as you are afforded the most valuable commodity on the mountain - acclimatisation. The Machame route takes you high to Lava Tower (4630m) on the day 3 and brings you down by nearly 700m for an overnight at Barranco camp (3950m). This is the secret to successful acclimatisation. The last water stop on the route is the Karranga Valley, as there is no water at Barafu camp. Barafu is the Swahili word for "ice" and it is a bleak and inhospitable camping area to spend the night. Totally exposed to the ever-present gales the tents are pitched on a narrow, stony, and dangerous ridge. Make sure that you familiarise yourself with the terrain before dark to avoid any accidents. The summit is now a further 1345m up and you will make the final ascent the same night. Prepare your equipment, ski stick and thermal clothing for your summit attempt. This should include the replacement of your headlamp and camera batteries and make sure you have a spare set available as well. To prevent freezing it will be wise to carry your water in a thermal flask. Go to bed at round about 19h00 and try to get some precious rest and sleep. After an early and well-deserved breakfast, it is a short 3-hour and scenic hike back to the Park gate. It is strongly recommended not to pay your porters any tips until you and all your gear have reached the gate safely. At Mweka gate you sign your name and details in a register. This is also where successful climbers receive their summit certificates. Those climbers who reached Stella Point (5685m) are issued with green certificates and those who reached Uhuru Peak (5895m) receive gold certificates. From the Mweka Gate you will continue down into the Mweka village, normally a muddy 3 km (1 hour) hike. In the Mweka village you will be served a delicious hot lunch!! You now drive back to Moshi for a long overdue hot shower, dinner and celebrations!! Overnight at the Springlands hotel.